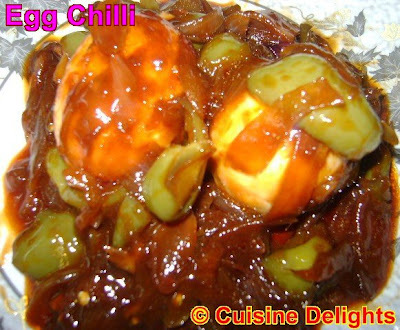 A delicious and easy to make chinese recipe for egg lovers. Tomato sauce : 1 tsp. Heat oil in a wok, saute the chopped garlic pieces then add onion fry well. Then add capsicum, slited green chilli, saute for 4-5 mins. Now add all sauce and salt, let it boil for a while. Add the eggs and mix well till they are coated with the sauce completely, cook on medium heat for few minutes.